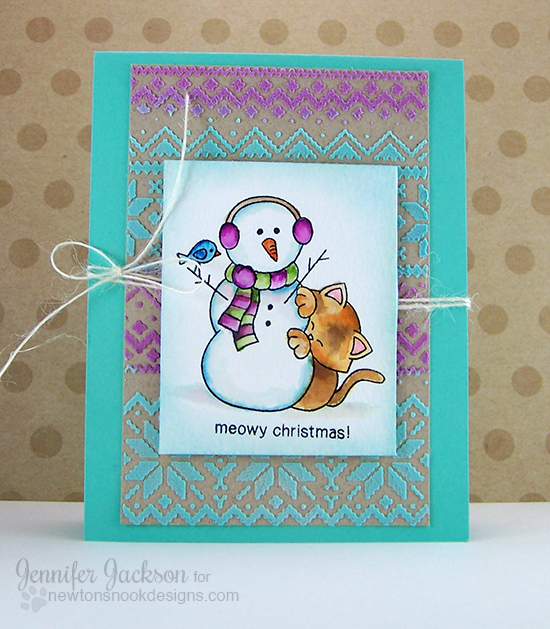 Newton's Nook Designs: Meowy Christmas Card! Today I'm sharing this card I created with our Newton's Curious Christmas stamp set. I stamped the image of Newton and the snowman onto watercolor paper and colored it with Distress Markers. I love the vibrant watercolor look you can get with these markers! 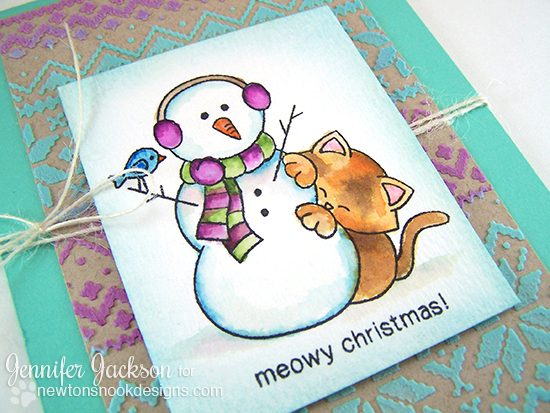 Then I added the "meowy christmas" sentiment from Newton's Holiday Mischief stamp set. For the background I used a sweater print stencil and some embossing paste over kraft cardstock. To color the embossing paste I squished a bit of color from the ink pad onto my work surface and then mixed in a bit of embossing paste with it. I made purple and blue to match the coloring on the image. I LOVE how this turned out - and it was so fun to make! Jennifer, this is adorable! I love the embossing paste background!! THIS CARD IS AMAZING!!!! I looooooooove the colors!! And that background...swoon! That sweater stencil - i KNEW i needed it! Honestly, this I my favorite holiday card EVER!!! this is such a cute card! i love the colors, i would have never paired those for a holiday card but i LOVE it! Gorgeous! Love the stenciled background! From the background to the sweet snowman and Newton, this is total delight! Gorgeous card, Jen! I love the colors on this! Makes me want to play with colored embossing paste. I've been using it white with snow but it's so pretty colored. I absolutely love the background you created! And watercoloring! My favorite card!!! This is spectacular! Love the background!